My doula holding my newborn son, and me with about 85 lbs. (not really) of IV fluid and pregnancy bloat back in ’02. Check! One more thing on my pre-baby to-do list has been completed! I have hired a doula! Now, I know many of you just went “Uh…doula? as in ‘feel your womanly birthing power and smell the patchouli, doctors are bad and hospitals are evil so you should just squat in a field’ kind of doula?” It’s okay. I used to think the same thing before I got pregnant with my son and I met an awesome doula. She had been a labor and delivery nurse for most of her career and when she retired, became a childbirth educator and doula. 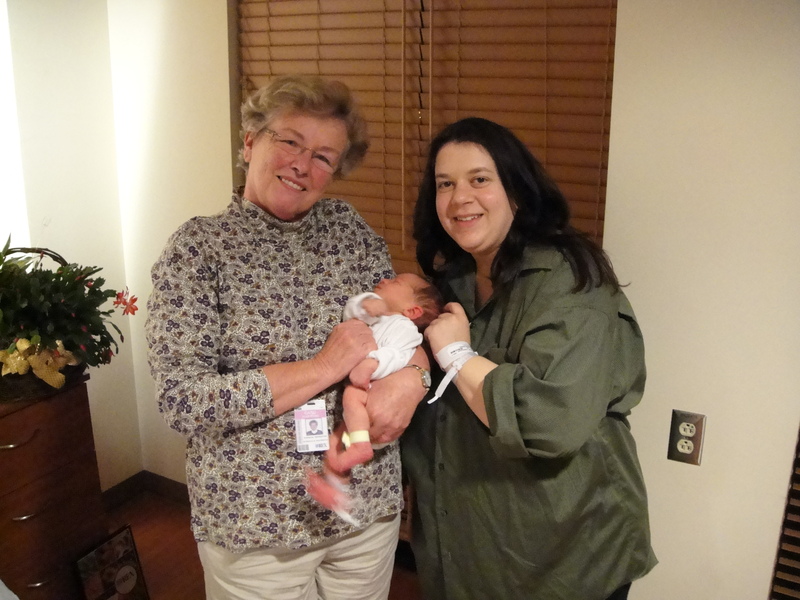 She had the medical background and knew her way around a hospital and enjoyed helping families welcome their new babies. Her job was to help me and my husband do what we thought best for our labor experience, whatever that was for us. She believed that ‘interventions’ aren’t always necessary, that the body is equipped to handle birth, but that medical technology can be very helpful and there are times when you do need them. So I was crushed to find out that she wasn’t available for my due date with this pregnancy. What made me decide to have a doula in the first place? Basically, I felt unprepared. I thought about what it would be like once I got to the hospital, just me and my husband in a room dealing with contractions and who knows what else. Then, while watching football one weekend, it dawned on me that a star quarterback won’t do so much as throw a ball without a coach telling him how and where to do it, nor will an Olympic swimmer swim a lap without a coach timing it and critiquing his strokes, so what makes me think that I can do something as monumental as bringing a human being into the world without a professional there to guide me? Personally, I am thankful for the technology we have today. I don’t want a home birth. I want to be close to an OR if I need a c-section or have some other complication. I want pain meds available if I reach a point where I truly believe I need them. But I do think that a lot of times medical professionals tend to jump to interventions a little too quickly. And frankly, although the nurses and staff in the L&D wing are great, they have too much on their plates to give each person in there a ton of individualized attention, especially with this crazy baby boom that seems to be going on right now. I like the idea of having someone there for me, watching out for what I need. My doula experience was great. After the first couple of contractions in the hospital, my doula said “In all my life I’ve only seen a few people that should labor in a rocking chair and you are one of them.” She left the room and came back a few minutes later, dragging a rocking chair with her. I spent most of the rest of my labor comfortably rocking and sleeping, despite pitocin and nausea. She knew tricks that I hadn’t seen in any labor book that really helped me be comfortable during a very long labor. Her help continued in a million different ways that my husband and I could have never thought, like explaining to me how different medications that were offered worked so we could make our own decisions, telling me about the doctor I ended up with (one from my practice wasn’t available that day), allowing my husband to have breaks, keeping me hydrated, taking notes of what happened throughout labor and delivery, and most importantly, reminding the nurses that I hadn’t had a chance to hold the baby yet as they were getting ready to take him for some tests (everything was fine – he was just a little stunned after delivery and they wanted to watch him to make sure his breathing evened out). I went into labor with a ‘let’s see how it goes’ attitude, and hoping I wouldn’t need an epidural or a c-section, not because I am against them, but mostly because I am scared of them and how I believe my body would react. Not for a minute did I think I was going to have a stalled labor that would require pitocin, nor get such bad nausea that I’d be in danger of dehydration. Having a pro there helped me take everything one step at a time, be able to discuss my options and in the end, have a positive labor experience. I honestly think that if I didn’t have her there, I would have felt like I somehow ‘gave in’ and agreed with the doctors instead of feeling like I made the choices that I wanted, even though I think it would have been the same. Does that make sense? And yes, despite the pitocin and everything else, I was able to make it without the epidural. Largely because I had a team (my hubby and my doula) to support me. No patchouli or twinkle lights, no ‘feel your birthing power’ mumbo jumbo, no anti-med jargon, no judgement on choices. Just support and advice during a process that can be scary and confusing. Much like how people get a real estate lawyer for house closings or hire wedding planners to make sure everything goes as planned. It’s not something you do every day, so why not have someone who does be there to guide you? And here is where I begin my plea: I think a lot of people are like me. They want the safety net of a hospital and are thankful that we have such good technology, but want an advocate for them – someone who is there for them, looking out for what works for them. I don’t think people want the uber-crunchy doulas who bring in rain dances and twinkle lights and are against medical procedures (despite their assurances to not be judgemental), but are looking for more of a coach and partner. So please, if you are a nurse or a nurturing person with a heart of gold, and aren’t uber crunchy, look into being a doula/labor coach. The world needs more non-crunchy doulas. This entry was posted in parenting and tagged delivery, doula, labor, pregnancy on July 23, 2012 by aliciamariel. So happy to read this! I’m searching for a non-cruncy doula in my area. It’s not that I don’t trust doctors, because I do, but just that I need someone who can coordinate the madness and make sure that I understand fully what is happening to me. But I can’t tolerate the “You are the moon goddess!” types of doulas – there’s plenty of room for them in the world of birthing, but I want a scientifically-minded person (woman or man, I don’t really care) who is an advocate for me and my family. I have a feeling that my search my be fruitless (I live in Seattle, which is sort of a Crunchy City), but I’m going to keep looking. I hope you find what you need. It’s hard, but don’t give up! Wishing you my best!